In an ever-growing restaurant landscape, successful franchises need a competitive edge to set themselves apart. For the rapidly expanding health and wellness brand Freshii, this competitive edge is their laser focus on the triple bottom line and the dedication towards their mission, to help citizens of the world live better by making healthy food convenient and affordable. The brand constantly seeks innovative ways to build on the company’s success through its people. When Freshii refers to citizens of the world in their mission statement, it truly refers to everyone, whether it’s the franchise partners, team members, staff at HQ, or communities that are connected to Freshii via their philanthropic WE partnership. On any given day, goal setting exercises, a company-wide huddle, and even fitness challenges are underway at Freshii HQ. The brand is always striving to challenge each other to be better, for themselves and for their franchise partners. Not your ordinary human resources department, Freshii’s People Culture team—works to ensure that the company’s unique workplace culture and values resonate across the entire system. 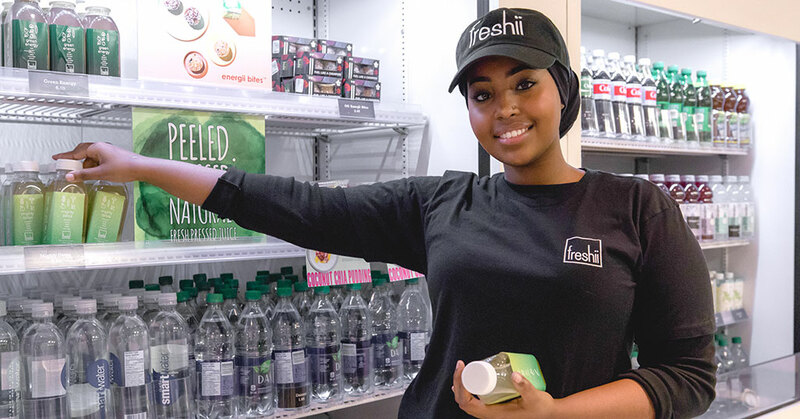 People Culture principles help develop and grow team members on the front lines and provide support to Freshii’s ever-expanding global franchise partner network. Freshii is constantly thinking about their franchise partners and the growth of their business, developing tools and rewarding top performers. This fall Freshii is sending two of their partners to Kenya to experience the direct impact that their philanthropic partnership with WE charity is making on local communities. The brand annually recognizes franchise partners in four different categories with Franchise Partner of the Year honors and regularly celebrates the top movers and shakers with Quarterly People Awards. To continue to grow and innovate, Freshii invites feedback from all stakeholders who interact with the brand - from guests to team members or franchise partners to HQ staff. It’s this constant circle of feedback and innovation that has allowed the people who interact with Freshii to feel so close to the brand. When the end goal is to help people live better lives, a thoughtful approach to caring for the planet comes naturally for Freshii. “Let’s be good to the Earth” is on the wall of each restaurant and touches every part of the business, from packaging and energy consumption to restaurant design and electronic marketing. This global-minded commitment carries over to Freshii’s philanthropic initiatives with international partner WE Charity. Thanks to sales from the brand’s designated WE menu, Freshii has donated more than 1 million meals to children in need and funded the development of a school kitchen and garden in Kenya. Freshii recently expanded the partnership with the first annual Communitii Day held on March 22 at every restaurant around the world. Freshii donated 10 meals for every entrée sold to donate hundreds of thousands of meals. Freshii’s focus on the triple bottom line has resulted in an impressive 20 consecutive quarters of same store sales growth, a competitive edge in franchising, and an important driver in changing the way the world eats.